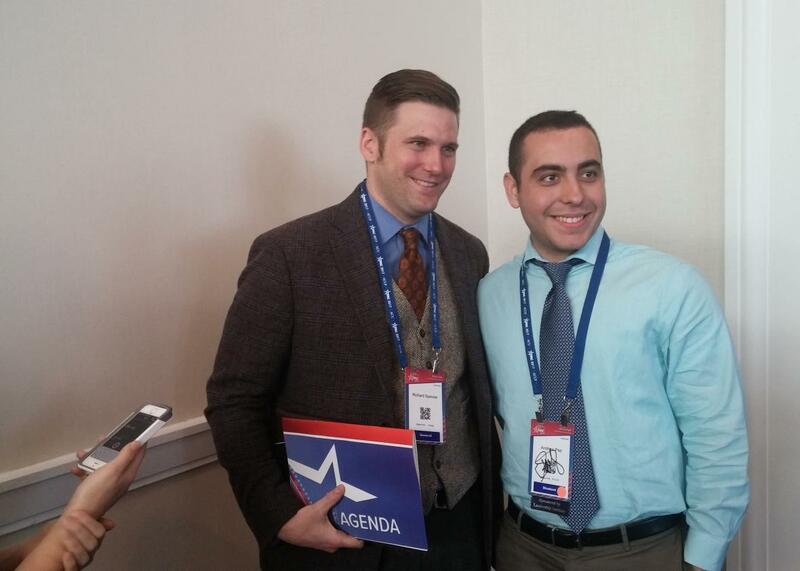 Richard Spencer and unnamed CPAC attendee. NATIONAL HARBOR, Maryland—Early on the second day of the Conservative Political Action Conference—the country’s largest annual gathering of the political right—Dan Schneider delivered an almost paternalistic lecture about dark, seductive forces afoot at his event. The executive director of the American Conservative Union, the group that organizes CPAC, started as parents often do by telling a story. A friend of his who worked in the Treasury Department had one time illuminated for him how to spot phony money. Maybe he meant another avatar of that movement. As it happens, one of the people sitting not too far from the stage during Schneider’s speech was alt-right leader and white supremacist icon Richard Spencer. During the speech, Spencer tweeted indignantly that he had invented the term alt-right, a contention he would take to what started as a small gaggle of reporters just outside of the conference’s main ballroom. He told these reporters he wished there’d been a question and answer section with Schneider. “Do they grant a white person the moral legitimacy to stand up for himself? To have an identity?” I would ask that,” Spencer said. “Are you morally opposed to white people understanding themselves? A few other young attendees then quickly recognized Spencer and approached him for photos, and the gaggle of reporters quickly and exponentially grew. 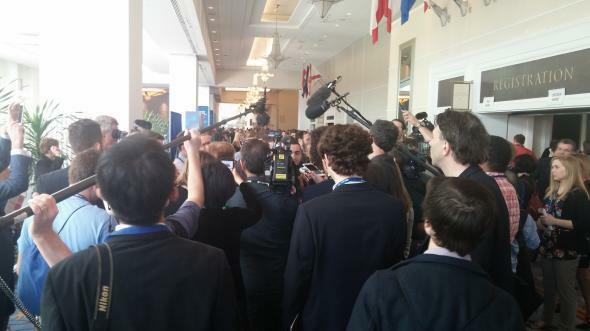 Within minutes, Spencer was the center of a press mob that blocked passage through the hallway. As security tried to keep the crowd under control, puzzled attendees peered to get a glimpse at who’d stolen the show from the four Republican governors who had by then taken the stage. Perhaps a senator. Maybe Trump. A few caught a glimpse of Spencer, recognized him, and rendered diverging assessments to their companions. That’s my boy, Ricky Spence! Hang on, I want a picture. Spencer’s in there somewhere, we promise. At around 11:20 a.m., though, Spencer—still surrounded by reporters—was asked to give up his credentials and leave. Security told New York magazine’s Olivia Nuzzi—with clarity that had eluded Schlapp—that Spencer’s views denied him a place at CPAC even though he had bought a ticket. * Shortly after this, a speaker took the main stage to explain how Muslim student organizations were working to import jihadist ideology to the United States—highlighting, almost comically, the xenophobia that has drawn some from the right wing into Spencer’s movement. Not long before being booted, Spencer remarked on the reception he’d received. *Correction, Feb. 24, 2017: This article originally misstated that Olivia Nuzzi is employed at the Daily Beast. She is now Washington correspondent for New York magazine.